Is salad not something your kids are drawn to.. check out this recipe as a great way to get them to eat their greens. 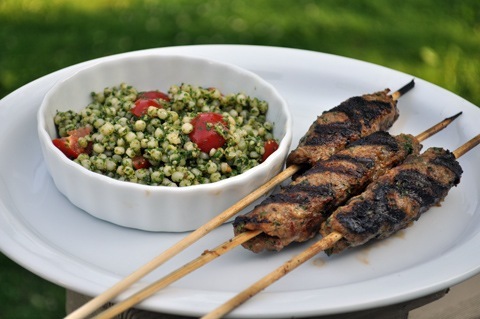 Last week we enjoyed Lamb Skewers with an Israeli Couscous salad. The salad then became a base for salad two days later with garden collections on the side. 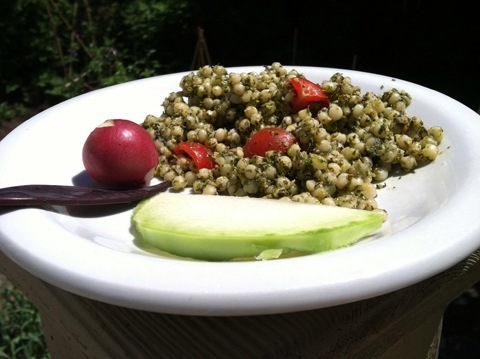 I adapted a couscous recipe from Food and Wine and used mixed greens from our garden. It was so fun to see the kids devour it, given we are still working on eating a mixed-green salad on its own. Bring a large saucepan of salted water to a boil. Add the 6 cups of mixed greens and blanch for 10 seconds. With a slotted spoon, transfer the arugula to a colander. Rinse under cold water to stop the cooking, then drain. In a small skillet, toast the sunflower seeds over moderate heat, tossing, until golden brown, about 2 minutes. Let cool. Squeeze the excess water from the mixed greens. Transfer the greens to a food processor. Add the sunflower seeds, garlic, cheese and the 1/2 cup of olive oil and process until the pine nuts are finely chopped. Season the pesto with salt and pepper. The day after having the lamb and Israeli Couscous, we went out-of-town for a day trip and had an activity planned the following morning. Not having been to the grocery store, we were limited on options. The salad provided the perfect fix, combined with a visit to our garden. Skoogie and O got to pick out what they wanted to add to the meal. We added sliced kolrabi, radishes and purple peas to the mix! You can't argue with lots of yummmms and garden freshness! How is your garden growing? Or if that doesn't fit your summer or yard, visit a farmer's market or local farm. You'll be amazed what you learn and find to feast on - enjoy!! !